The iRestore Laser Hair Growth System is a medical device approved by the FDA which is used to treat hair loss or thinning hair. This laser treatment is of clinical quality and can be used for both men and women alike to stimulate the growth of hair to help make it fuller, thicker, and healthier. The best part is that it is painless, non-invasive, and convenient! FDA-Cleared Medical Device For Treating Hair Loss. Grow Thicker, Fuller, and Healthier Hair With iRestore. Expect To See Visible Improvement In As Little As 12 to 24 Weeks. Clinically Proven to Promote Hair Regrowth. It is most popularly used for treating androgenetic alopecia, hair loss, balding, or thinning hair. Low level laser therapy has been proven to be effective at increasing regrowth of hair in clinical studies. It is also believed to have positive effects when used in conjunction with other hair regrowth therapies. One of the best advantages about this is that it doesn’t require any drug treatments and is painless, so you can do it safely and without any hassle. Not only does it work great for hair regrowth, but it can also be used to help thicker and fill out your hair as well! Our team of professional engineers have designed lasers to emit 650nm red light wavelengths in order to most effectively target hair growth. This light is absorbed by the hair follicles in order to help increase the growth rate of hair, even fostering growth in those that have stopped growing. This light is emitted using 51 medical-quality lasers and LEDs which enhance the growth rate and reproduction of hair follicles. The iRestore Laser Hair Growth System is designed for simple, safe, and comfortable use. Secure the device to your head by setting it on top. Press the start button and the process will begin, shutting off once the cycle is completed. You should use the iRestore Laser Hair Growth System every second day for a session of about 25 minutes. Results will vary from person to person, but you should see positive results between 12 to 24 weeks. Its design allows you to place it on your head while it runs so that you can have your hands free for use. This means you can carry on with most regular routines around the house while you get your treatment. It is safe to use and effective at achieving results without any hassle. You also don’t have to worry about taking any drugs or the adverse side effects that can come with them. This also means that you don’t have to worry about it having negative reactions with other drugs either, a risk you run when combining various drugs. You should see results relatively quickly, typically in only 12 to 24 weeks. This means that you can get quick results that will last long and look great. It is lightweight, durable, and comfortable to use. It’s hand-free use also lets you to easily wear it around the home. Therefore, the iRestore may work better with other treatments than on its own. If at any point you are unsatisfied with the iRestore Laser Hair Growth System you can return it within 6 months of use for a complete refund. Just contact the company directly. It is important that you refrain from looking at the laser light directly as it could potentially cause harm. You should also ensure that your hair is dry before you use it. The device itself should also always be kept away from water, wet spots, or anything damp just in case. Make sure that it is never in reach of either children or pets. We hope this helped you make an informed decision. You can get more at the iRestore website or on Amazon. By getting an iRestore laser hair growth system you can make sure that you get your hair to grow back, fill out, or simply thicken! Either way, it’s simple and easy with online ordering options. 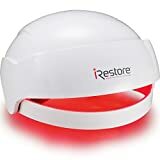 The iRestore hair growth system is a great buy for hair regrowth options because it is effective, convenient, and easy to use. It offers strong performance with its 51 medical-quality lights emitting 650nm red light wavelengths. These high-grade lights help work to give treatment to the scalp and hair follicles in order to help regrow and thicken your hair. thanks for so many useful informations about this device..! Hi. Be careful people. I ordered the iRestore during the first week of November. It apparently shipped 3 days later. Mid-December and I still haven’t received despite haivng paid for it. I’ve been trying to call the company….no answer. I’ve emailed the company, and besides receiving one email saying they were looking into it, I have received no more contact. Desperate now because it’s a lot of money. Will have to contact VISA and hope they can go after them if there is literally no way to contact them. Sorry to be a downer but….. I usually put leave in conditioner, serum and a drop of Argan oil right after I wash my hair to keep it moist. Can I still use irestore??? I also take vitamin B6!